Powers/Abilities: Cleito's abilities are unknown, but she is a mothergod figure, similar to Gaea, though perhaps more tied to the nature of reality than the planet Earth. She is presumably immune to aging, disease, etc. (Strange Tales IV#2 (fb) - BTS / 4 (fb) - BTS) <According to Termineus> - An ancient creator being's dreams (of darkness and light, love and hate, male and female, life and death, etc) were given form via the creator's staff. The Fallen Stars were born; living beings--each one the embodiment of one of the creator's thoughts and/or feelings. Each one unique in the role it would play in the drama of creation. The Fallen Stars took shape and fell from the sky through the void of the universe, in the process creating planets, galaxies, etc. The creator hurled its staff into the boiling heart of Earth, forming the first land, from which was born the first woman: Cleito...mother of all things. From Cleito's loins sprang the first man, her perfect mate--yet in all ways her opposite. All others would follow Cleito, embracing and exulting in the creator's majestic illusion. The place where Cleito and K'ad-Mon were born became the Nexus of Reality. BTS - In some fashion Cleito was reborn via Evenor of Atlantis. (myth/legend) - Evenor was one of the earthborn primeval men, or autochthons (offspring of the soil), who were the first to make their homes in Atlantis, living in a hill in the center of Atlantis. Via fellow autochthon, Leucippe, Evenor sired a daughter Cleito. After Evenor and Leucippe died suddenly, Poseidon/Neptune married Cleito and altered the landscape, making the hill impregnable. And so he carved circular belts, three of sea and two of land around the hill isolating it completely, for at that time sailing was unknown. He also brought up springs of warm and cold water producing all kinds of food. Poseidon and Cleito had five pairs of twins who, along with their descendants, ruled the ten provinces in which Poseidon had divided Atlantis. The island and the ocean were named after Poseidon's first-born Atlas, who was also king over his brothers. The brothers, and the descendants of their ten royal houses ruled over many other islands, and also over the Mediterranean peoples living west of Egypt and Tuscany. The ten kings, who governed each his own province, are said to have assembled every fifth year and every sixth year, administering the public affairs and delivering judgment according to the law which Poseidon handed down to them and, according to records inscribed in a pillar of orichalcum. (Man-Thing III#7 (fb) - BTS) - Cleito ruled the Ten Kingdoms of Atlantis--each of which was under direct control of her five pairs of twins--from its capitol, the City of the Golden Gate. Pilgrims journeyed there, seeking hope in times of hopelessness, relief from suffering, absolution from sin. (Man-Thing III#8) - Cleito, who received a fragment of the Nexus of Reality from the future, gave the fragment to the time-traveling Ellen Brandt and the K'ad-Mon-possessed Man-Thing so they could use it to preserve reality. (Man-Thing III#7 (fb) - BTS) <18, 000 BC> - When the Cataclysm drowned the Ten Kingdoms, the City of the Golden Gate was believed utterly destroyed. In reality, Cleito, Evenor, and a number of undines or nereides (sea sprites) remained within the sunken city. (Man-Thing III#7 (fb) - BTS) - After Cleito's death, Neptune--reborn at some unknown point in time--made guarding the sacred Shroud of Cleito his holy mission. (Heroes Reborn#1-4 - BTS / Man-Thing III#7 (fb) - BTS) - When the Nexus of Realities shattered (as a result of the heroes breaching the dimensional barrier from Franklin Richards' Counter-Earth), a portion of the fragment became lodged within the Shroud of Cleito. The fragment actually became part of the Shroud retroactively, back to the dawn of its creation. 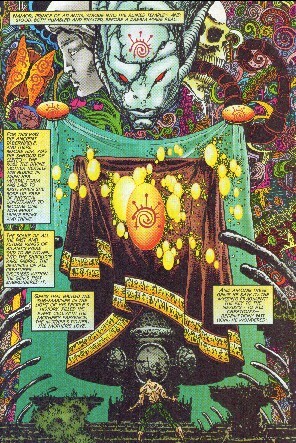 Knowing that K'ad-Mon and/or the Man-Thing and Ellen Brandt would seek to remove the Nexus Fragment from the Shroud, and thus desecrate it, Evenor made plans to prevent this from happening. (Man-Thing III#7 - BTS) - Within the Golden Gate, Evenor explained to Namor, Ellen, and K'ad-Mon/Man-Thing that to remove the Nexus fragment from the Shroud would desecrate the Shroud of Atlantis' holy mother, which he could not allow. K'ad-Mon/Man-Thing attempted to take the Nexus fragment by force, at which point Evenor transformed him back into a helpless Ted Sallis. (Man-Thing III#8) - Evenor allowed Namor to kneel before the Shroud of Cleito, while the power of K'ad-Mon, via the Staff of the Creator, transported Ted, Ellen, and Namor into the distant past, before the sinking of Atlantis. There they traveled to the Temple of Cleito, where Cleito herself gave them the Nexus fragment, then blessed them in their continuing journey. (Strange Tales IV#2 (fb) - BTS) - Cleito was recruited by Sorrow along with the rest of the Fallen Stars to oppose Mr. Termineus' plot to bring about the end of reality. (Strange Tales IV#2 - BTS) - Cleito and the rest of the Fallen Stars confronted Termineus, along with K'ad-Mon/Man-Thing, Ellen Brandt, and others, in the swamps of the Florida Everglades. (Strange Tales IV#3-4) - Cleito and the rest of the Fallen Stars witnessed Termineus' destruction of all reality, as well as Ted Sallis and Job Burke's restoration of all reality. The Stars decided to allow Job to return to his old life, to live out his life to the fullest, and to only return to his destiny at an early date. Comments: Adapted by J. M. DeMatteis and Liam Sharp. It occurs to me as I write this profile that Cleito could easily be an aspect of Gaea. Mr. DeMatteis was kind enough to share with me the paid for, but unpublished, scripts to Strange Tales IV#3-4, information from which I've added to this profile (in italics). They are referenced in Peter Parker: Spider-Man, and fit perfectly into continuity. At some point, I'll post the scripts and plots to the net for everyone's enjoyment. The Creator referred to in the Man-Thing/Strange Tales stories was supposed to be the Abrahamic God (or, more correctly, some non-denominational creator being)..
Cleito is a real character from the legend of Atlantis; just do a Google search...unfortunately, you pretty much find different versions of the above myth. It is hard to gel the legends of Atlantis of the real world with the history of Atlantis in the Marvel Universe. The real world legend dates back to close to 10, 000 BC, the city was first established in the Marvel Universe sometime around 25, 000 B.C. The real world legend has it sinking around 2400 B.C., but in the Marvel Universe, it sank around 18, 000 B.C., which is apparently WAY before the birth of Poseidon. The Atlantean Gods are way older than we might have originally thought. Cleito was not associated with pre-Cataclysmic Atlantis in the Marvel Universe, but rather with the post-Cataclysmic world colonized by Homo mermani in 6,000 B.C. I don't have it all worked out yet, but this would appear to make the most sense when looking at the aquatic Evenor we saw in the pages of the Man-Thing. In addition, Evenor refers to the Shroud as existing untold thousands of years ago. It could be that Evenor existed in ancient, pre-Cataclysmic Atlantis, and that Cleito did not become Neptune's mate until after the sinking of Atlantis (which might have been what caused Evenor and Leucippe to die suddenly--though then you have the problem of Atlantis being named after Atlas, Cleito's son...). Perhaps Evenor was then somehow reborn, either before or after the death of Cleito. Possibly Neptune transformed them into sea creatures, or perhaps they had the power to do so themselves. Perhaps it was Neptune or Evenor who created the first Homo mermani? I prefer the latter of the two. There have been multiple floods in the Marvel Universe, and there is no reason one couldn't have occurred in 2400 B.C., too. I have to think that the writer was writing the story based on the real world history. Perhaps the City of the Golden Gate was separated from Atlantis proper long ago. Again, I don't have it all worked out yet, but that's the way it looks to me.